Is your organic vegetable garden much less healthy or you’re having more insect pest damage, than you had in the very first year you planted it? If you answered Yes, then it’s most likely you've mined your soil of all the available nutrients, and you haven't added back to your soil in the form of compost and organic fertilizers. Testing your soil will help ensure that this won't happen again. 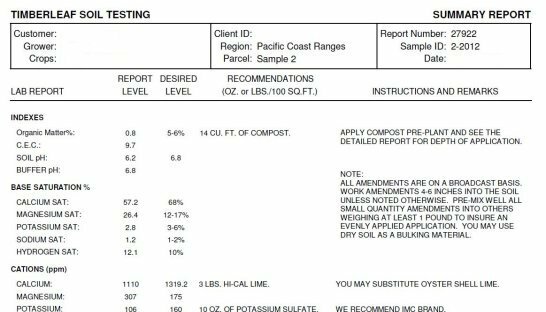 Trace Mineral Soil Test - Zinc, Manganese, Iron, Copper, and Boron. This test is recommended for all first time home growers and annually for commercial growers. Soil testing takes the guesswork out of organic gardening, and it saves money, time and effort. A healthy soil produces healthy plants, and healthy plants are more resistant to insect damage and disease. I recommend ONLY using a reliable soil-testing laboratory for your soil. A home soil test kit will not provide you all the information you need to ensure a successful organic vegetable garden. I use an excellent company called Timberleaf Soil Testing. Timberleaf's program goes a step beyond most other soil testing services. They consider the whole organic gardening environment by testing soil elements plus closely examining cultivation practices. Timberleaf has been serving mini farmers and residential organic gardeners to grow top quality, nutritionally rich produce for over twenty years.